Please feel free to forward this website to everyone. Thank you! Stampede Excitement started with a previous experimental painting I did from my own photograph titled 'Winning Combination'. I was so intrigued with the process of watercolour paint striking the thin handmade straw fiber paper that the excitement seemed to jump off my brush while recreating it. My inspiration for Forest Glow Came from thoughts of the numerous fires that plague Western Canada and USA during the summer seasons. Some years are worse than others, but with people and lightening, there is always a chance of more. It’s my inner senses that brought my thoughts to light on paper through water media. 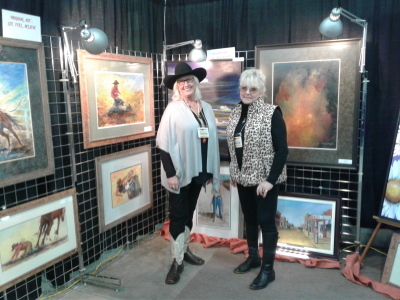 Jan is a versatile Alberta Working Artist. No matter what medium or subject, her expressions of life can be calm, lively, exciting, and colourful. Born and raised in Calgary where her preferred activities were Art and Sports. This is also true today as you will discover lots of action and excitement in her artwork. After Western Canada High School, she entered the work force, and then a few years later moved to Red Deer where she enrolled in College. After graduating, CKGY/Z99 Radio became her employer for over 20 years as a Creative Writer/Director and Executive Sales Marketer. Over the years, she has been tutored by several renowned Art Instructors from Canada and the U.S.A., and is also an Art Instructor when time permits. 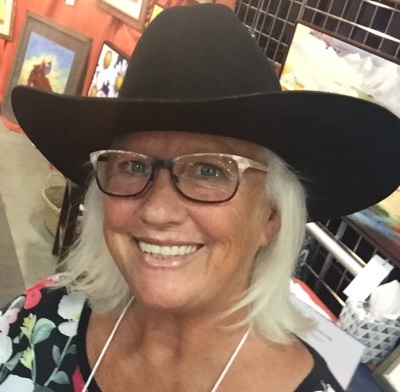 Her work has been displayed at many juried venues including 6 consecutive years at the Edmonton Canadian Finals Pro Rodeo Gallery; Calgary Stampede, Red Deer Museum and numerous other Art Shows and Exhibits throughout Alberta. In 2011 Jan received the Lillian Nunn Scholarship Award for her artistic endeavors. 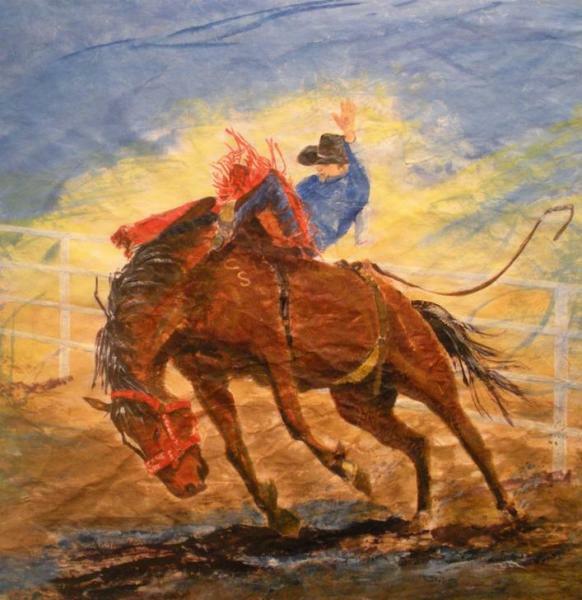 Her Corporate collectors include the Canadian Rodeo Hall of Fame Ponoka, City of Spruce Grove and Melcor Developments Municipal Art Collection, Wipro and Atco I-Tek of Edmonton, as well as, private collectors in Canada, U.S.A., Mexico, and India. Jan is a past Secretary of A.C.A.C.A. 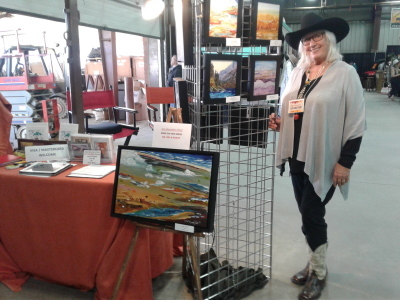 (Alberta Community Art Clubs Association) and presently holds memberships in The Red Deer Museum & Allied Arts Council, Alberta Society of Artists, Visual Arts Alberta-Carfac, and Federation of Canadian Artists Vancouver. In 1990, Jan and her husband Lou Paul moved 30 minutes East of Red Deer to the Haynes area where they built and started their Sage Brush Hills Ranch, which also features a 500 sq. ft. Art Studio. It is a perfect fit for creating art, and has plenty of natural light for viewing. It’s another aspect in the art life of Jan Howden-Paul. Numerous art pieces in various areas of Canada, U.S.A., Mexico, and India. I have created many commissions and attained various articles on local media over the years. Lists are available. 2011 Jan received the Lillian Nunn Scholarship Award for her artistic endeavors. 2005 to 2008 N.W. Watercolor Society, Seattle, Washington, U.S.A.
General Art Classes throughout School, and self-taught through Art Books, Magazines and experimentation. 2009/07/06/05/04 Alberta Community Art Clubs Assoc., Central Alberta Zone Shows, Various Alberta locations. 2005 Alberta/Saskatchewan Centennial Mosaic Mural with my two original portraits, Mayorthorpe Four Fallen Officers, and Country Music Artist, Lou Paul.